There are 21 species of woodpeckers found in the United States, seven of which are present in Indiana. Year-round Indiana woodpeckers include the downy (6 3/4″ in length), hairy (9 1/4″), red-headed (9 1/4″), red-bellied (9 1/4″), pileated (16 1/2″) woodpeckers and the northern flicker (12 1/2″). The yellow-bellied sapsucker (7 3/4″) is a resident of Indiana during the winter months. Woodpeckers have short legs with two sharp-clawed toes forward and two backward-pointed toes. These toes, along with their stiff tail feathers, allow them to cling to trees, utility poles, or wood siding. Their strong, pointed beak is used for digging insects from trees, excavating nesting cavities, and for “drumming.” Since woodpeckers do not have true “songs,” they use sharp calls and perform rhythmic tapping (better known as drumming) with their beaks on surfaces such as dead tree limbs, metal poles, and building siding to attract a mate or announce their territorial boundaries. Both male and female woodpeckers drum. It is primarily this drumming behavior that may cause serious problems for homeowners. Downy: 0.74-1 ounce, Hairy: 1.41-3.35 ounces, Pileated: 8.83-12.36 ounces. Downy: 6 ¾ inches, Hairy: 9/ ¼ inches, Pileated: 16 ½ inches. Downy:11-12 days/20-25 days, Hairy:11-15 days/28-30 days, Pileated:15-18 days/26-28 days. Downy: 1/3-5, Hairy: 1/3-6, Pileated: 1/3-5. 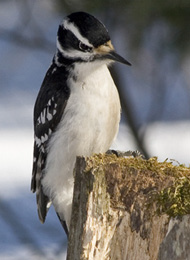 The downy (Figure 1a) and the hairy (Figure 1b) woodpeckers cause the most damage in Indiana. Both are identified by their white backs and black and white striped wing feathers. The downy is sparrow-size and has a short bill. The hairy woodpecker is robin-size. 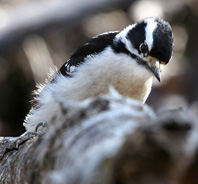 The downy also has black and white bars on the outer tail feathers while the hairy has entirely white tail feathers. In both species, the male has a red spot on the back of the head. 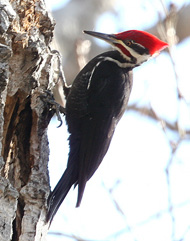 The largest and easiest woodpecker to identify is the pileated (Figure 1c). Pileated woodpeckers are crow-sized and have a crested red head with dark brown to black feathers. Flashes of white are seen when the bird is in flight. To accurately identify these and other woodpeckers, a field guide with color illustrations is recommended. Although all types of buildings and materials may be attacked by woodpeckers, damage most often appears on cedar-sided buildings during the breeding season (March – May). Excavated cone-shaped holes in siding can be several inches across and the holes may penetrate to the insulation layer. These holes are rarely an indication of insect infestation. Holes caused by mammals usually have a ridged or gnawed appearance and are often located near corners or overhangs. Cedar window fascia is also damaged by woodpeckers. Corners are often chipped off and smaller holes are excavated. Woodpecker damage to trees is characterized by a shredded or ragged appearance. Some individual peck-holes may also be apparent. The yellow-bellied sapsucker bores neat rows of 1/4″ holes spaced closely together. Most often, they bore on trees rather than structures since they feed on sap. Several options are available to the homeowner to reduce or prevent woodpecker damage. It is best to make use of several of these non-lethal methods at the same time as soon as the damage begins. Woodpeckers can be frightened from the area by banging pots, clapping hands, or honking horns. Spraying the bird with a high-pressure water hose can also be effective (Figure 2a). Using high-reflective mylar tape (1/2″ width) has also been successful (Figure 2b). The mylar tape is looped loosely from the roof soffit under the gutters or is strung vertically over the damaged area. In the latter case, use several parallel strands for best results. Commercially available helium-filled mylar balloons (preferably silver) can also be used in a similar manner. Tie the balloon to a rock using fishing line or a strong string so that the head of the balloon bobs in the damaged area (Figure 2c). The rock and balloon can be moved around the structure as needed. Do not use mylar balloons in areas where overhead power lines are present. Woodpeckers can be prevented from reaching siding by mounting fine mesh netting or screening from the outside edge of the eave down the side of the structure (Figure 2d). Fig. 2. Woodpecker damage control methods for structures: a) high-pressure water hose, b) high-reflective mylar tape, c) helium-filled mylar balloon, and d) fine mesh netting. Drumming or pecking may also be discouraged by covering the affected area with heavy (3+mils) plastic sheeting. The plastic should be stretched tightly over the damaged facade of the structure and attached with tacks, staples, or tape. This will prevent the woodpeckers from being able to grip the rough texture of siding with their claws. Woodpeckers cannot peck or drum if they cannot hang on to the surface of the structure. The plastic can be put up or removed as needed. If substantial damage has already occurred to the structure, holes should be repaired using wood filler, wood plugs, or silicone caulk. Temporary screening or metal flashing should then be placed over the areas to prevent further damage. If damage occurs repeatedly, homeowners may choose to cover eaves, siding or window facings with vinyl or aluminum siding. Because damage is seasonal and may occur each year, the homeowner may also choose to use mylar tape, balloons, and/or netting to prevent damage rather than waiting for damage to occur. If you are considering building a new home or remodeling an existing home in woodpecker habitat (almost all of Indiana), you may wish to select vinyl/aluminum exterior siding or masonry in order to prevent chronic woodpecker problems. There are no repellents or paints proven to prevent or reduce woodpecker damage. There is also no evidence that shows that a painted surface is less desirable than an unfinished surface as a drumming site. Woodpeckers are beneficial birds that feed mostly on insects. They are protected by both federal and state laws. If non-lethal methods are ineffective in stopping woodpecker damage, a US Fish and Wildlife Service (USFWS) permit application can be requested from the Indiana USDA-APHIS-Wildlife Services Office. If approved by the USFWS, this permit authorizes an individual to trap or kill the damage-causing woodpecker. Trapping methods may include capturing woodpeckers in a mist net and relocating the bird in a suitable habitat or installing a snap-type rat trap to kill the bird on site. The USFWS permit may also authorize shooting the woodpecker where it is legal and safe to do so.